Do Cars Still Have Carburetors? Fuel injection systems have changed significantly in the 100 years since cars started becoming regularly seen on the world’s roads, and carburetors were one of the first fuel systems to be used, lasting well into the twentieth century. The level of refinement that these mechanical fuel injection systems underwent in the 80+ years that they were popularly used has led to a somewhat unexpected outcome in today’s automotive landscape. All production vehicles today use computerized fuel injection systems to feed fuel and air into the combustion chamber of the engine. Computer controls allow the engine to operate at peak efficiency in all situations, and allow the vehicle to start right up, even on cold days. Some automotive enthusiasts may be familiar with motorcycles, which are one of the last holdouts of the factory production carburetors today. In order to get a bike started on a cold day, you have to pull out the choke. After that, you have to let the engine warm up. Otherwise, it simply won’t run right. 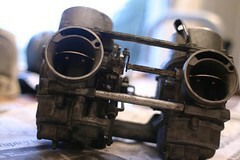 Carburetors on cars operated the same way. To start the car, you had to pull out the choke and let the engine warm up. Modern fuel injection systems don’t require this warm-up period. Many of today’s cars and trucks are now utilizing direct-injection, a system that has been proven to improve engine efficiency, and by turn, increase consumer fuel economy. Where standard fuel injection systems simply made carburetors outdated, direct injection makes them look positively quaint. There are some very obscure auto makers, primarily in Africa and Russia, who still build cars with carburetors. These cars are typically designs that have been purchased from their original manufacturers and remade for a new market. To keep expenses down, these auto makers avoid computer controls and use mechanical components such as a carburetor on their cars to make them more easily repairable. In this is the greatest positive attribute that can be found in vehicle carburetion. Carburetors, unlike fuel injection systems, are relatively straightforward when it comes to repairing them. Fuel injection requires sophisticated computers, but carburetors require only a screwdriver and a willingness to get one’s hands dirty. This ability to easily rebuild carburetors has led to their extensive use in motorsports, hot rodding and enthusiast driving. This allows the owners of the vehicles to tune their fuel needs according to the performance parts in their engine. While carburetors may not have a life in new vehicles today, chances are good that they’ll still be used for many years to come. Curious to get your own vehicle’s carburetor checked out? Check out our full range of services to get your car in top form!